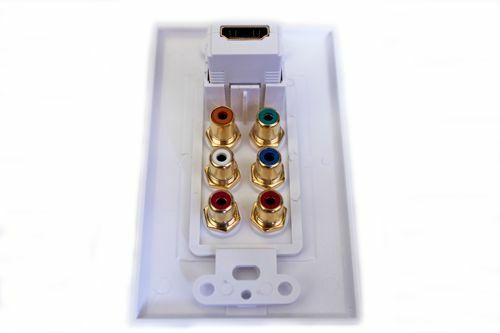 What could be better then to have everything on 1 easy to use wall plate! 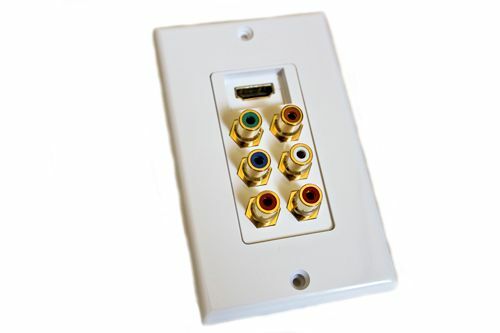 Put the finishing touch on home theater and audio / video installations with these high quality wall plates. 1080p Notice - As you have likely read 1080p is Full HDTV and a real bandwidth hog. Anything other than a direct connection from device to display shortens the distance you can run your cables. While our HDMI Wall Plates support 1080p they do have limits. Depending on the quality of cable your using you can get up to 15 ft. This is great for running from a cable box / satellite receiver or blu-ray up to a display. If your trying to run HDMI over a long distance you need to consider HDMI Repeaters and amplifiers at 1080p. 1080i and 720 can be run at much farther distances with no problem. The other thing to consider is quality cables. The " low price " name brand cables can be a challenge. Look at the gauge of the cable. If it's is less then 28 awg pass on it. Also make sure its copper not copper clad steel. This also greatly reduces the ability for you to get a quality picture. The other thing to consider is quality cables. The " low price " name brand cables can be a challenge. Look at the gauge of the cable. If it's is less then 28 awg pass on it. Also make sure its copper not copper clad steel. This also greatly reduces the ability for you to get a quality picture. Nothing else to buy! ( except cables )and guess what we have them also!